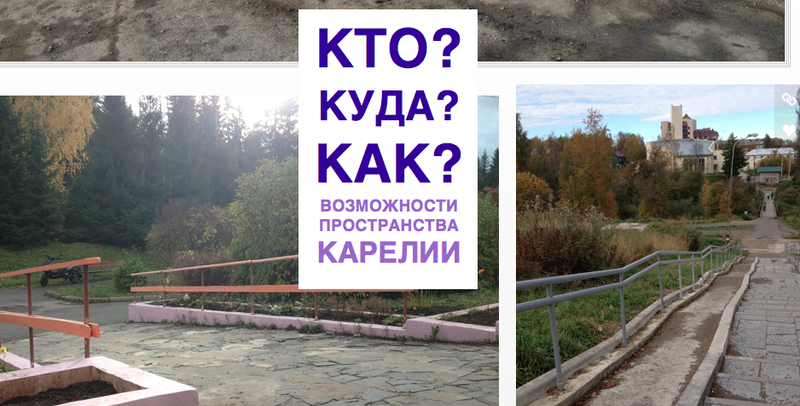 You might remember a meme that got passed around the internet last fall, showing pictures of utterly inaccessible ramps from around Russia. Russian accessibility activists like to call these the “galochki” or check-mark ramps: Is there a ramp? Yes! Does it work? Who cares?! It’s there, put a check mark in the accessibility box! around Petrozavodsk and surrounding regions. We hoped to get lots of submissions from the general public, and even tried announcing a contest as a way to spur people to action. But, responses have only trickled in. This is partly because so few people with mobility impairments travel or go for leisurely walks in Karelia in the winter anyway – the feet upon feet of snow the region receives is quickly compacted on walkways into the dark brown, slick and slippery substance known in Russian as “slyakat'” – which makes movement through the city difficult for everyone, regardless of mobility capacity. I am happy to say that by the third week of April, we are finally “slyakat'” free, and some new photos have started to trickle in. I’m taking the opportunity to post many photos that I’ve taken myself over the past few months. Russians may say that spring officially starts on March 1st, but I’m going to take it upon myself to say that today – the first day that it rained instead of snowed – it is finally, finally spring in Karelia. Check out the new photos, comment away, submit your own examples, and don’t forget to pass our website on! Now that the weather’s nice, we’re planning a “day of action” coming up to collect a whole lot of photos at once.